Location: Farleigh Hungerford, Somerset, England. 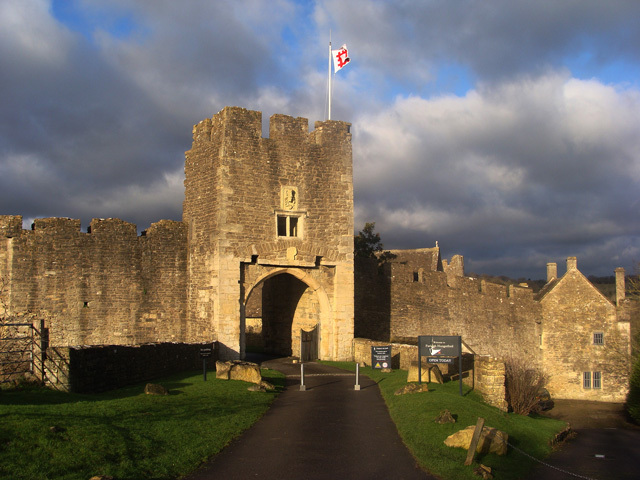 Notes: Farleigh Hungerford Castle, sometimes called Farleigh Castle or Farley Castle, is a medieval castle in Farleigh Hungerford, Somerset, England. The castle was built in two phases: the inner court was constructed between 1377 and 1383 by Sir Thomas Hungerford, who made his fortune working as a steward to John of Gaunt. The castle was built to a quadrangular design, already slightly old-fashioned, on the site of an existing manor house overlooking the River Frome. A park was attached to the castle, requiring the destruction of a local village. His son, Sir Walter Hungerford, a successful knight and courtier to Henry V, became rich during the Hundred Years War with France and extended the castle with an additional, outer court, enclosing the parish church in the process. By Walter's death in 1449, the substantial castle was richly appointed and its chapel decorated with murals. The castle largely remained in the hands of the Hungerford family over the next two centuries, despite periods during the War of the Roses in which it was held by the Crown following the attainder and execution of members of the family. At the outbreak of the English Civil War in 1642, the castle, modernized to the latest Tudor and Stuart fashions, was held by Sir Edward Hungerford. Edward declared his support for Parliament, becoming a leader of the Roundheads in Wiltshire. Farleigh Hungerford was seized by Royalist forces in 1643, but recaptured by Parliament without a fight near the end of the conflict in 1645. As a result, it escaped slighting following the war, unlike many other castles in the south-west of England.The last member of the Hungerford family to hold the castle, Sir Edward Hungerford, inherited it in 1657, but his gambling and expensive living forced him to sell the property in 1686. By the 18th century the castle was no longer lived in by its owners and fell into disrepair; in 1730 it was bought by the Houlton family, when much of it was broken up for salvage. Antiquarian and tourist interest in the now ruined castle increased through the 18th and 19th centuries. The castle chapel was repaired in 1779 and became a museum of curiosities, complete with the murals rediscovered on its walls in 1844 and a number of rare lead anthropomorphic coffins from the mid-17th century. In the 1915 Farleigh Hungerford Castle was sold to the Office of Works and a controversial restoration programme began. It is now owned by English Heritage, who operate it as a tourist attraction, and the castle is a Grade I listed building and a Scheduled Ancient Monument.